Torrey Smith is scheduled to make $5 million in 2018. Will the Eagles pay it? Now that the happy hangover of the Philadelphia Eagles' celebration is over, let's take a look at each position and figure out which players will be back in 2018, and which ones will be playing elsewhere. On Saturday we started with the quarterbacks. Sunday we continued on with the running backs. Today, we'll cover the wide receivers. In early December, the Eagles signed Jeffery to a four-year contract extension worth $52 million. He rewarded them with 12 receptions for 219 yards and 3 TDs in the playoffs. Alshon Jeffery: Stay or Go? Smith is a good person and locker room presence, however, the Eagles will have to decide if they want to pay him $5,000,000 this season, or part ways with him. In my view, he did not play well enough in 2017 to justify that price tag. He led the team in drops by a considerable margin, and often went long stretches without making plays in the offense. If Smith agrees to a pay cut, then the Eagles should consider keeping him. If not, they are better served using those resources elsewhere. Torrey Smith: Stay or Go? What a difference one season can make in the NFL. 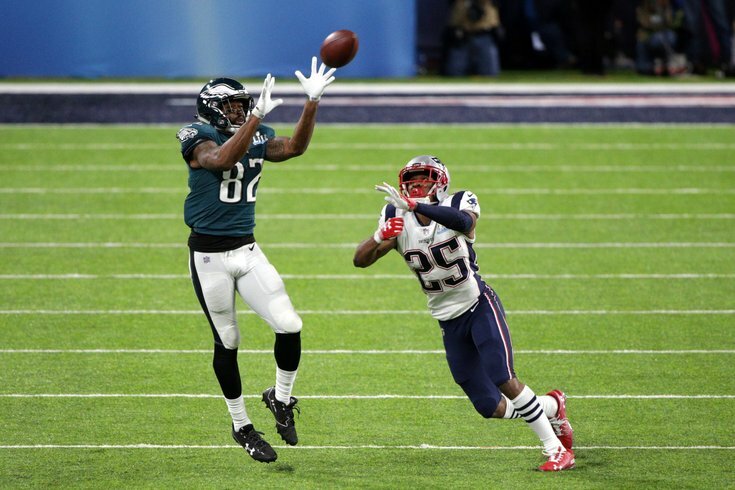 This time last year, most Eagles fans would have been willing to catapult Agholor out of the city. A year later, everyone was freaking out when he was ill a few days before the Super Bowl. On the season, Agholor had 62 catches for 768 yards and 8 TDs. Nelson Agholor: Stay or Go? While I believe that thinking of Hollins as a starter next season to potentially replace Torrey Smith is a little premature, Hollins is probably in line for some kind of bigger role in 2018. At a minimum, Hollins showed that he can be a quality special teamer, while flashing speed and blocking ability in the regular offense. #JimmyVerdict: Obviously, Hollins will be back. Mack Hollins: Stay or Go? Gibson had a horrendous training camp his rookie season but made the team because he was a fifth-round pick with upside. Gibson predictably spent most of the season on the inactive list, though he did dress late in the season, including all throughout the playoffs and the Super Bowl. Gibson can't possibly be worse in 2018 training camp than he was in 2017 when he simply couldn't catch the football, so improvement is inevitable. The team seemed to be rewarding his hard work by allowing him to be among the active 46 and playing on special teams. #JimmyVerdict: Gibson is a good bet to be back in 2018, as the team has shown willingness to be patient with him, but he can't be anywhere near as bad in camp as he was in 2017. Around the time Gibson started dressing for game day is when Johnson began showing up on the inactive list. Word is that the team was hoping Johnson would step up during the regular season and force his way into the lineup by making plays, but he was unable to capitalize on his opportunities. #JimmyVerdict: Johnson had a great camp in 2017. He'll probably need an even better one to survive in 2018. Marcus Johnson: Stay or Go?